Bangladesh ended up being my favorite country visited in 2017. Landing in Dhaka, I noticed that there was quite a lack of tourists- at least tourists that I could identify as European or American- and I spent the next few days wondering why! Dhaka’s traffic may be intense, but the city makes up for it in unique architecture, fascinating (if a bit tragic) history, amazing food, and a thriving academic scene bringing art and life into the city (college students are quite politically active, and the student population has sustained many casualties throughout Bangladesh’s history as a result). Andrew and I met up with a new friend and walked through museums, sculpture gardens, a lithograph studio in a college art department, and more. People were kind, getting around was fairly easy, and I found myself wishing within the first day that I’d set aside more time to explore the country. While in Bangladesh, I wanted to know more about the current state of the country’s $28 billion dollar garment industry (did you know that only China does more business in this area than Bangladesh?). With several years gone by since the world’s eyes were opened to the plight of workers through the Rana Plaza tragedy, I was hoping to hear good news. 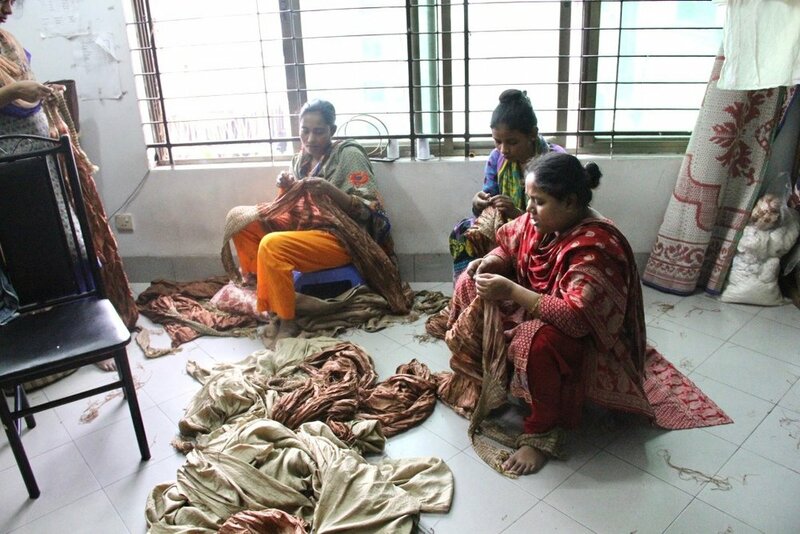 I reached out to Fashion Revolution Bangladesh, who connected me to Asif, a FashRev member in Dhaka who happened to work with SNV, an organization focused on many projects around the world, including bettering the situation of women working in Bangladesh clothing factories. Asif graciously answered my many questions, and helped me put the pieces together of what factory environments look like currently. I was happy to learn that due to the tireless work of local advocates, most Bangladeshi factories are improving the benefits offered to employees. Out of the 4000+ documented factories in the country, 2300 are now complying with government regulations for health and safety, providing basic healthcare funding and education for workers, and even opening up to the outside influence of local non-profits and worker’s rights groups. SNV is specifically working on a program for female garment workers to help them gain access to medical care, reproductive health services, and training on how to advocate for themselves. I learned that big brands like H&M won’t work with factories that haven’t signed on to the Accord on Fire and Building Safety (read it here), A very useful legally binding document between brands and factories ensuring safe facilities in the wake of Rana Plaza. Since this accord’s inception, inspectors have flagged more than 118,500 hazards (mostly fire and electrical) in nearly 2000 participating factories working for 200+ brands (source). Encouraging, in a way, I guess, but also the bare minimum. It seems as though big brands have done just enough to get reporters and consumers off their backs, and have mostly avoided responsibility for the suffering caused by Rana Plaza. If you exclude Rana Plaza and other mass killings, 2017 was the deadliest year yet to be a garment worker in Bangladesh. Wages are still very, very low (hovering at just over $80 per month) and haven’t been increased to a liveable wage. “That’s next”, Asif told me, after current initiatives for basic safety and benefits are successful. Most of the work that is being done right now is simply to enforce and encourage compliance with building safety measures and basic benefits that the factories already should have been implementing. Any extras, higher wages… that will need to come with time. Bangladesh’s labor secretary has proposed a wage increase to $150 per month in 2019, which would nearly double the current salary. Armed with this new information, I still wanted to walk around and talk to the people around the area where Rana Plaza’s ruins and many still-functioning factories are located. I’ve always felt that the news coverage of what happened at Rana Plaza was a bit limited and controlled. I guess, also, that visiting Rana Plaza was also a sort of a pilgrimage for me… A very tangible reminder of why I hold the values I do when it comes to my purchasing habits and my life work. To get to the site of the Rana Plaza collapse, we needed to travel to Savar, a short drive outside of Dhaka city proper. On our drive we passed lots of high-rise housing, built to accommodate garment workers, factories, and training facilities. Walking down the street to view the Rana Plaza monument, I noticed that the drainage gutters alongside the road were running red- dyes from nearby factories were being flushed out and making their way into the soil, and eventually, I’d assume, whatever unfortunate body of water was nearest. The monument itself is small and simply constructed from cement. 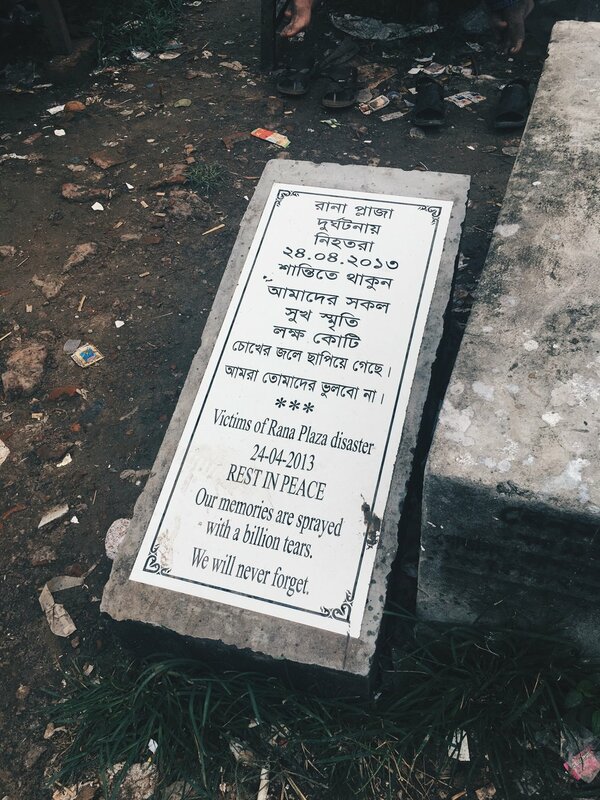 I was told that no one (government or brands or advocacy organizations) stepped up after the Rana Plaza disaster to create a monument, so workers and their friends and family members pooled money to erect it. The government doesn’t want it there (for obvious reasons), but there it stands on the side of the road. The space where the Rana Plaza building once stood is still vacant. Our local friend who accompanied us told us that a few student groups have come up with ideas to build a resource center for garment workers on the site, but no one has stepped up to the plate to fund such a project. 24th April 2013 witnessed one of the most bizarre worker killings in the history of the garments industry of Bangladesh with the collapse of Rana Plaza building. Although the building was declared unsafe on 23rd April, the greedy building and garments owners forced the workers to come to work by physically assaulting them and threatening them of dismissal on 24th April. After the building collapsed few of the trapped workers were rescued by the relentless efforts of the civilians. Civilians were evacuated from the rescue operation on 29th April and rescue began using heavy equipment. During this period the government started covering up by hiding dead bodies. According to the official statement the number of dead bodies and survivors recovered during the rescue operation was 1,130 and 2,438 respectively. However according to the locals and survivors, the actual number of workers was much higher. This alter stands here in protest against the planned killing of countless workers and coverup of their bodies, and also as a symbol of unity among the working class. While I was taking in those words, a tea vendor who’d set up shop near the monument motioned us over. We sat on wooden benches and sipped from our glass cups while I asked many more questions and learned many details that I hadn’t been aware of before. The death toll could have been lower. It took days for local police and emergency workers to begin rescue and recovery operations within the Rana Plaza Ruins, due to worries about the instability of the pile of rubble and a lack of training in how to deal with a building collapse. In desperation, family, neighbors, and students from a local university climbed the piles of cement, looking for survivors. The death toll could have been higher. The Rana Plaza building had a retail space and a childcare facility in the lower portion. The store and daycare were shut down the day of the tragedy. People knew that the building was unsafe, even beyond the workers who pointed out structural damage. And yet the workers were manipulated and threatened into working that day. The still-vacant site of the Rana Plaza collapse, cleared of debris. It was a bit shocking for me to process these new details- to learn that something already so horrific was even more horrific than I knew. I felt angry, I felt sad, and I felt motivated by the idea that we can’t stop at “better”, when it comes to improving conditions for garment workers in Bangladesh, we have to at some point get to a place where life is not just bearable, but GOOD for the workers who have already suffered much injustice. I saw a few posts on Instagram recently from a well-known advocacy organization praising several mainstream Bangladeshi factories they’d toured for the environment they’d created for workers with healthcare, childcare, and an up-to-code building. While any progress is wonderful and necessary, I do worry that glowing words might falsely give advocates and consumers alike the feeling that it’s okay to take pressure off of brands having clothing manufactured in Bangladesh, or feel comfortable buying clothes manufactured there in factories claiming they’re “better” now. Based on my conversations with locals, and what I experienced myself, I believe that a “made in Bangladesh” label still comes with unnecessary hardship for workers. Even if a garment comes from a “better” factory, It’s probably not coming from a “perfect” or even “good” factory. So, the answer to “what’s really changed in Bangladesh since Rana Plaza”? Some things have changed for the better, but at the same time, certainly not enough has changed… yet. Wages need to be higher. A CEO from one of the world's top five global fashion brands has to “work” at a comfy desk (or, let’s be real, sit on a yacht) for just four days to earn what a garment worker breaking her back in Bangladesh will earn in an entire lifetime (read this report from Oxfam if you want to get good and mad) , and that is despicable. Brands need to be given more of the responsibility for making things better for garment workers, since they are the ones disproportionately profiting off of the cheap labor. Factory owners in some cases can be terribly unethical, true, but many of them are trying to be fair but are often “pushed” into making bad decisions for their workers because they are at the mercy of the brands. For example, here in the Philippines, workers are paid too low, but factory owners literally can’t pay them more fairly because if they don’t meet a big brand’s price standards the brand will just opt to go manufacture in Vietnam where labor is even cheaper and their cost per piece can be even lower. What’s worse: to pay your workers too little, or to shut down your factory and put all your workers out of work because you refuse to take jobs from big brands that pay so little? The reality is this: Things won't change in Bangladesh simply from the efforts of local advocacy groups, or the actions of "ethical consumers". They only way things can really, truly change is if companies shift from the current capitalist model of profit-maximizing-at-all-costs, and start focusing on the well being of the human lives they are affecting. This is where we, as consumers, come in. We can’t just be easily quieted and made content with a small step in the right direction, a “fair trade” label, or a clever marketing campaign or a few sentences about sustainability on a brand’s website. I’m calling myself out on this, as well, remembering my own experience of happily purchasing an overpriced, fair trade certified product only to find out later that the company’s overseas workers were still being paid poorly and all that profit was just going into the pockets of USA staff and resellers. We can, and must, keep asking for change.